No one’s hair is perfect! Pinpoint your specific hair issues and start finding solutions to your biggest hair problems. Your hair feels dry to the touch. Sometimes, it looks wiry and/or feels stiff. The breakage never stops. Solution: Your hair is telling you that it needs more moisture. Apply a water-based moisturizer once or twice a day. If your hair seems very dry, add moisturizer until your ends are slightly damp and then gently put your hair up while the moisturizer absorbs. Thick, creamy moisturizers are the best choice for damaged or chemically-treated hair. You may also seal this moisture in with an oil. Your hair seems to grow slowly or not at all. You have trouble growing your hair past your shoulders. Solution: First, realize that your hair is always growing. It grows one half inch per month on average. That means with average growth and no breakage, it would take 2 years to have hair the length of a 12-inch ruler. To keep your hair growth on pace, make sure you are getting healthy doses of essential vitamins and nutrients through food and/or supplements, consuming ample amounts of water and taking care of your ends so that your hair isn’t breaking as fast as it’s growing. When your natural hair gets wet, it shrinks into tight curls, usually to a length above your shoulders. You love your curls but you want to enjoy your hair length too. Solution: Shrinkage is a problem specific to natural African American Hair. If you prefer curls or waves instead of coils, you can reshape your hair as it dries. Read these instructions to learn how to do a “Twist Out” or “Twist N Curl”. Your hair is difficult to comb or brush because it gets tangled and knotted very easily. You find split ends even when you’ve been taking really good care of your hair. Solution: These problems are easily solved with the right products and a regularly scheduled hair trim. You must use products that condition and reinforce your hair so you can prevent damage before it starts. Healthy, well protected hair can stand up to moderate combing and brushing without breaking. If your hair is already damaged, you must start by having a professional stylist cut off as much of the damaged hair as possible. Split ends make your hair less manageable and cannot be repaired. You can treat them with reconstructing products, but it’s better to get rid of existing damage and prevent split ends before they start. A good stylist can cut your hair into a face-flattering shape while removing old, damaged hair. 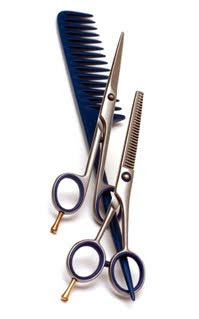 After that, schedule a trim every 6 to 8 weeks so that vulnerable ends get cut off before they have a chance to split. Small hairs fall onto your shirt, floor, or sink whenever you comb or brush your hair. Your hair never seems to get longer. Solution: Breakage is due to extreme damage. Hair weakens first, then splits, and then breaks. Make sure your mane stays clean and moisturized with products that are specific to your hair’s needs. Look for products that contain ceramides, hydrolyzed protein, silicone, shea butter, coconut, olive, and/or avocado oil to soften and strengthen your hair. You also have to find a way to put less stress on your hair. Extreme heat (over 350°F) and chemical treatments are the most common causes of breakage for African American hair. Explore new hairstyles so that you can minimize harmful treatments. If you are already using the right products and a gentle technique, it’s likely that a trim (by a professional stylist) will give your ends a “fresh start”.